The Slap USB Bracelet is the newest addition to Flashbay’s multifunctional USBs, specially made to easy slap on your wrist so that you can bring it with you wherever you go. This USB bracelet has been uniquely designed and manufactured by Flashbay. Its trendy style, combined with a high quality USB Drive memory, makes it an ideal promotional gift. 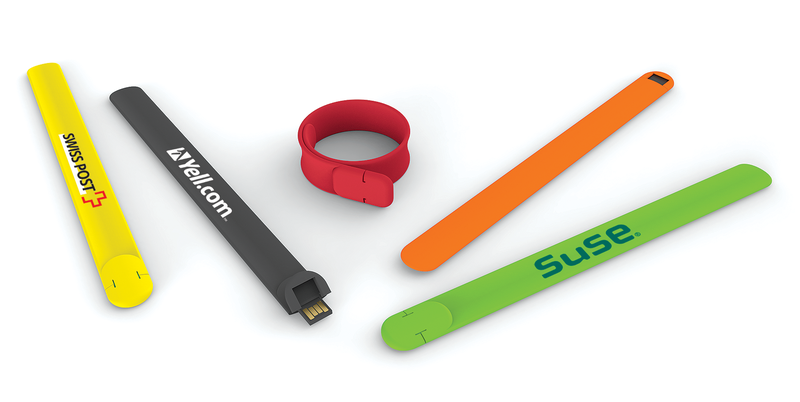 You can customize your very own USB Bracelet to suit your needs, whether it is to promote a corporate event, showcase during a trade fair or for schools and universities special occasions. The wristband itself is exactly like a normal slap bracelet but with a USB plug in one end, which is easily accessible by flipping back the silicon cover. This innovative custom USB bracelet is designed so that you have a large branding surface to add your company’s logo or get your message across. Its silicon exterior makes it comfortable to wear and fits all wrist sizes thanks to its slap design. This is a fun way for your customers and clients to carry around music, photos, presentations or any other type of data. If you are as excited about this new product as we are ourselves, then take a further look at the coolest USB promotional gift of the summer.